When I was a teenager in Cyprus, from the age of about 15 to 18, I used to waitress a few evenings a week after school and over the weekend. My first waitressing job was at a traditional Cypriot taverna which holds a lot of memories for me, called Vatouthkia. I must get round to writing a dedicated post about it soon. When you go out for a meal in Cyprus, no matter how hot it is, it always ends with a coffee! Either a simple nescafe (usually reserved for the tourists!) or ‘proper’ Greek coffee; sketo (without sugar) metrio (medium) or glyko (sweet). And one of my tasks at Vatouthkia was to make this coffee. Pretty daunting, when it has to be just right, and you’re serving it to the locals who know exactly how it should be done. And it isn’t just a case of putting some in a cup and adding hot water – it’s brewed in a small pot over heat, and stirred until just right. It’s strong but the flavour is incredible. 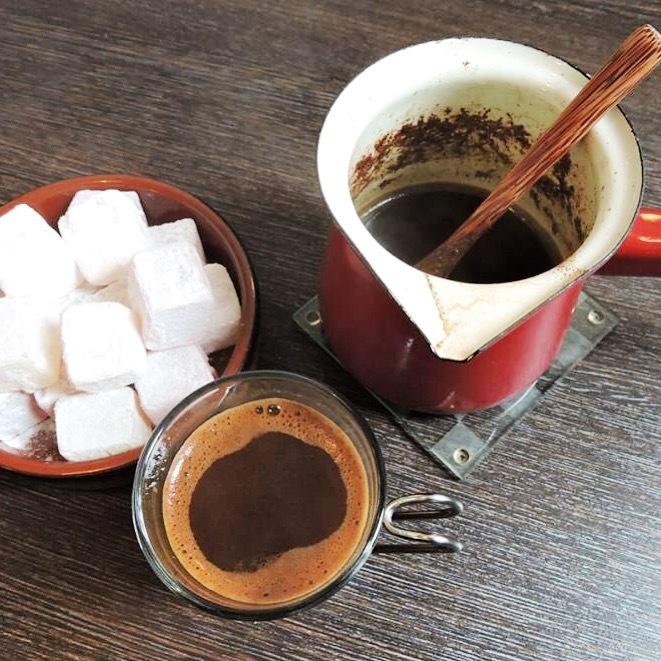 So the other day, when I heard about a new company called Özerlat, a Turkish coffee company from Cyprus, I was so excited to try out their products, as I knew (or at least hoped!) they would be very similar to what I used to make many years ago. They might even have been what I was using in the restaurant back then, but it’s too long ago to remember! 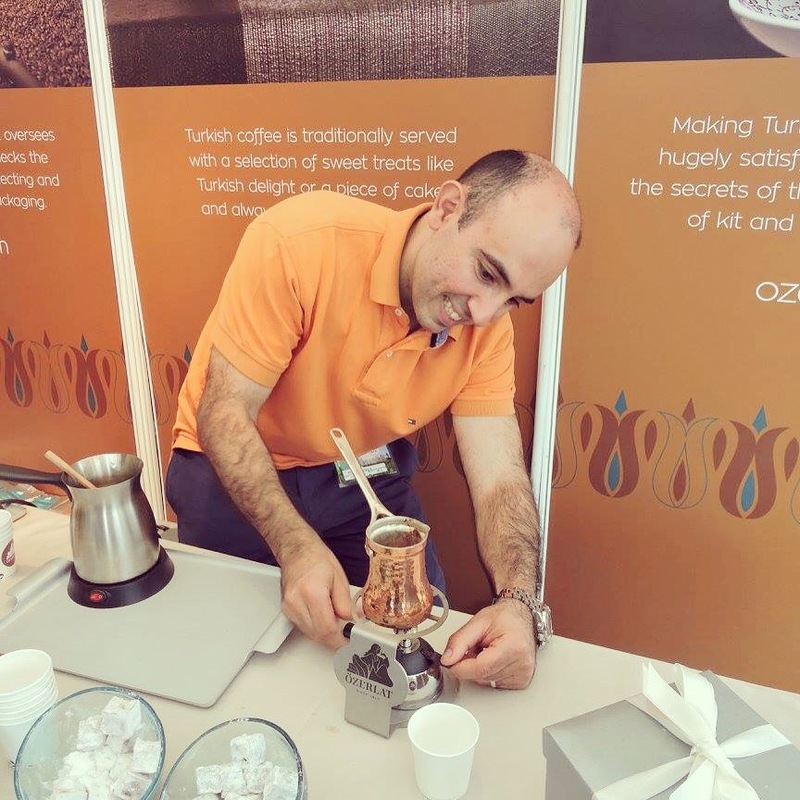 As you may have read in my previous post, I met Özerlat for the first time at Taste of London last month, where I was able to try some of their beautiful coffee and meet the family. 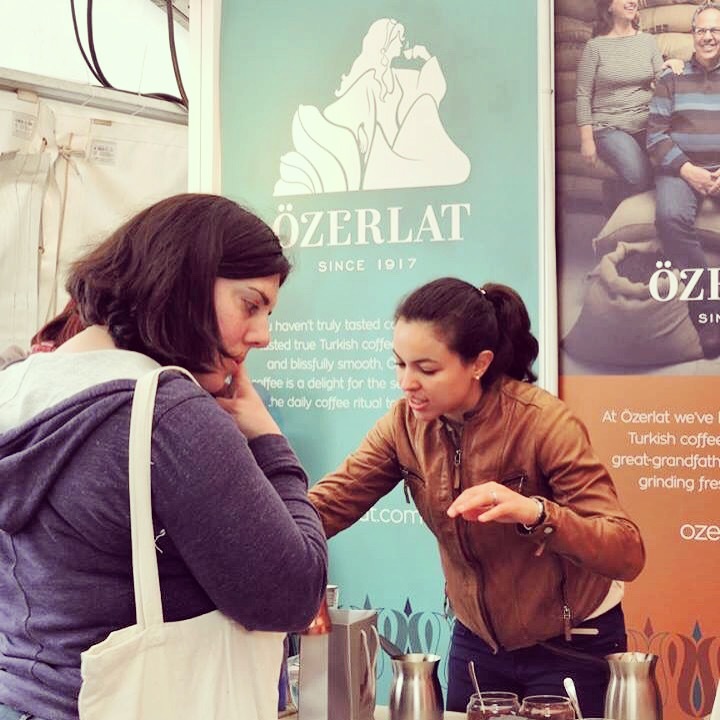 Özerlat is very much a family business which is now in its fourth generation, after it was established in 1917, and has a modern roasting, grinding and blending facility in Nicosia. They are now looking to bring their coffee to the wider UK market. They have two coffee types – Heritage and Mozaik. Their head roaster Derviş Özerlat oversees each day’s production, from selecting and roasting the beans to grinding and packaging the coffee. Importantly, the blends are made from 100% pure Arabica, with no flavours or preservatives added. Heritage is their classic Turkish coffee blend; topped with a velvety soft foam, it offers dark chocolate and freshly baked biscuit aromas over complex flavours of bitter chocolate and rose. Mozaik is their newest coffee blend, ‘re-invented’ for the modern coffee drinker. It offers sumptuous roasted nut and red berry aroma, with a buttery palate showing hazelnut, cranberry and tangy citrus notes. I tried out both of them at home – if you want to do it properly, you should use a traditional ‘cezve’, but I used a similar ceramic version which I bought from Divertimenti. It’s a fairly simple process but you need to get the timings right. You add the coffee (and sugar if necessary) to the pot with water and place over a medium heat, stirring gently. You allow the coffee to brew and then just before it boils, as the foam starts to rise at the edges, you lift the pot away from the heat and pour out the froth. You then repeat the process and before it boils, pour the rest into the cup, making sure to maintain the froth – the froth on the top is a sign of a good cup of coffee! I wouldn’t say I’ve perfected this, but I’m getting there with practice! I served it up with some cold water and Rose and Lemon Turkish Delight. And the flavours really blew me away. There are so many levels of flavour and it reminded me of home so much, it was like clicking my fingers and going back almost 15 years. Serious nostalgia factor! It left a thick sediment at the bottom, just as I remember it. In Cyprus, the older generations would read your fortune from the bottom of your cup! 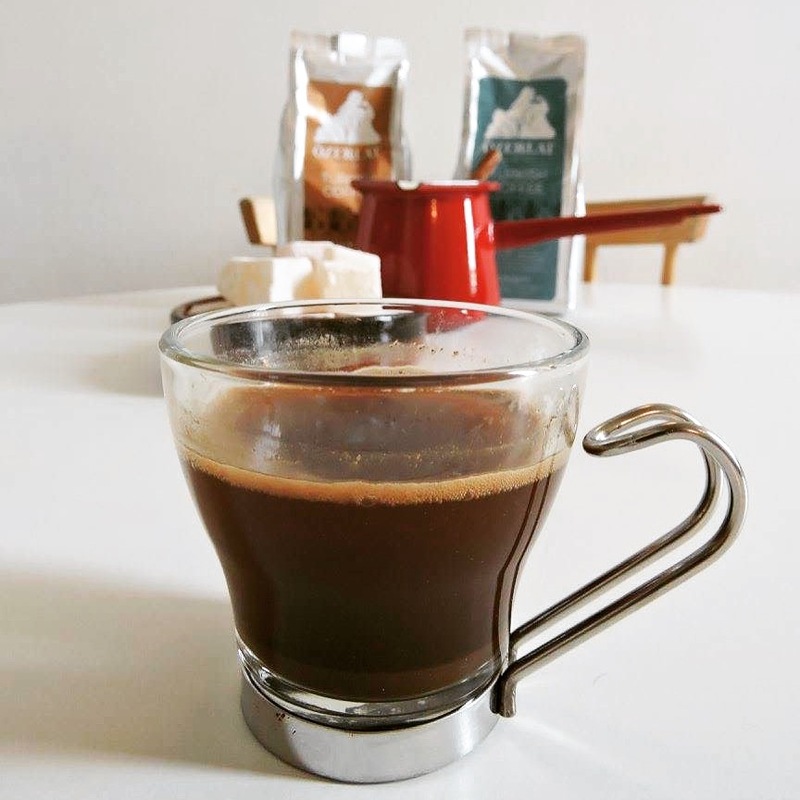 Speaking to Iley, the lovely UK Director of Özerlat, it sounds as though they really want the Brits to embrace this love of coffee making, introducing it as part of your dinner party, or inviting friends round for coffee. This isn’t an ‘on the go’ coffee that you would grab on the way to a meeting. It’s something to cherish and enjoy, like a fine wine. I can’t wait until we move into our house and we can invite our friends round to be able to do just this. If you’d like to try out Özerlat’s coffee for yourself, a 250g bag (enough to make 35 cups) of Mozaik is £6.20 and Heritage is £5.80 (excluding postage). You can buy it directly from their website here. 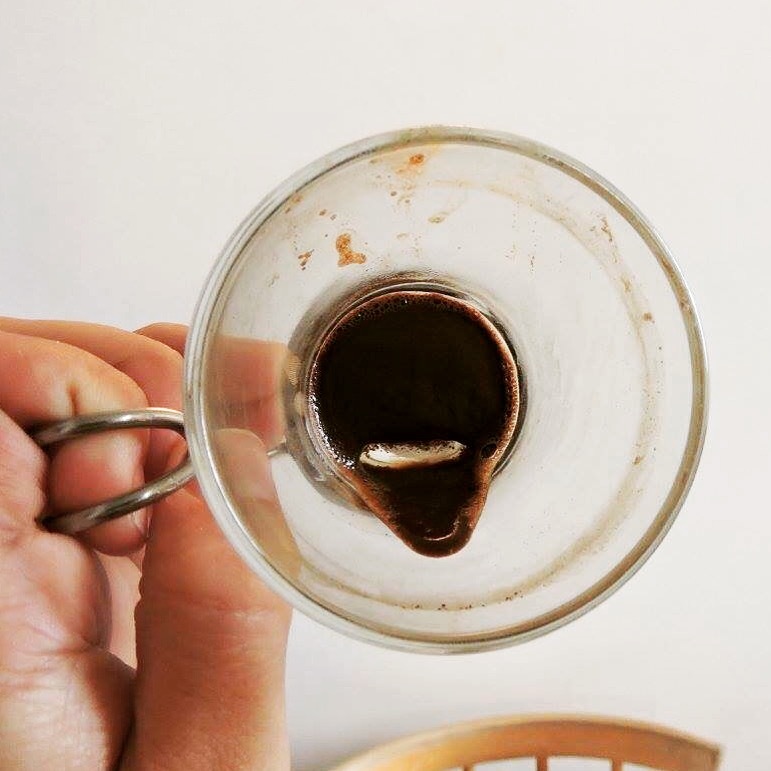 Have you ever tried Turkish coffee? What were your thoughts? Let me know in the comments below! I was provided with coffee samples for review purposes by Özerlat but did not receive any payment. All views are my own. I’ve been playing around with Turkish coffee for a few months now, trying to teach myself how to do it right. Since I don’t know anyone who knows how to make it (or even knows what it is) I’ve been trying different methods I’ve found on the internet. I must say that it’s a much more intricate process than using a French press, which is normally how I make coffee. But the end result can be delicious. I’d love to try some Turkish coffee made by someone who really knows what they’re doing one of these days. Previous PostA Quick & Easy Guacamole Recipe!